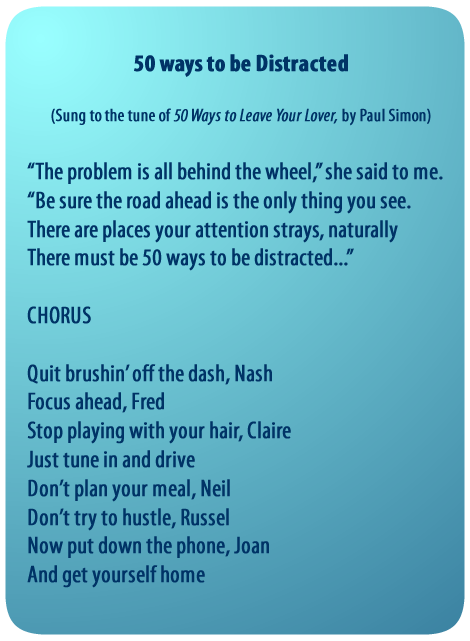 50 Ways to be Distracted – What Are Yours? Think quickly now! What do the following 10 activities have in common? removing food crumbs from around your mouth, patting your puppy, eating a sloppy sandwich, trying to quiet scrapping kids, fumbling for an address, grooming facial hair, searching for sunglasses, grooving out to tunes, picking something out of your teeth and scanning a map. engaging in a heavy conversation, looking for stray or gray hairs in the mirror, ruminating about your finances, adjusting the radio station, taking a photo, checking directions, removing your coat, texting a friend, drinking scalding hot tea and fixating on a billboard. Maybe by now, you’re getting the drift that these are all things not to do while driving. And they are among many, many ways to be distracted behind the wheel of a car. answering your cell phone, up righting a spilled travel cup, wiping the inside of a mucky windshield, staring at an interesting pedestrian, wondering how you’re going to break bad news to someone, organizing your backpack, anticipating an upcoming social event, admiring the collector’s car just up ahead, calculating your team’s odds of winning or considering complex travel arrangements. All these activities dilute your attention. Just focus! Cell phones, the frequent target of police crackdowns, like the one in September and more planned for this year, are a common culprit. (Well, really it’s people’s use of communication gadgets that is the problem.) An ICBC video contest winning entry created by Brandon Card, indicates cell phone use is attributed to 25 per cent of crashes. It also shows the average time spent looking away from the road while texting is 4.6 seconds – equivalent to driving the length of a football field at 80 kilometres per hour. reliving an argument, ogling your odometer, recalling an ecstatic moment, wrestling with a candy wrapper, fantasizing about (well… whatever you choose to dream up), dusting your dashboard, laughing your head off, reflecting on your life, tweaking your tie, and straining to make sense of a bumper sticker. 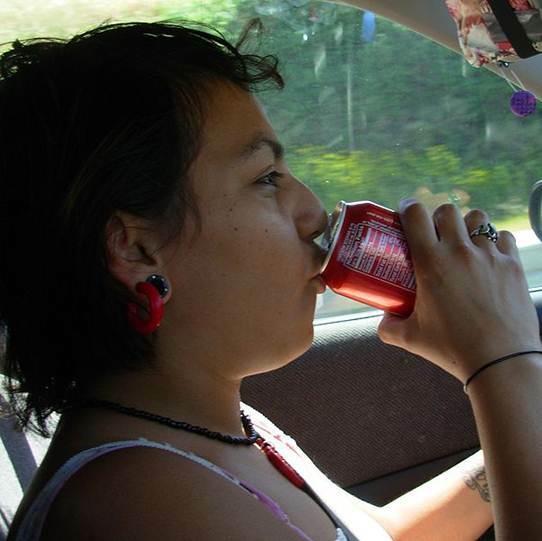 Distractions like these (and infinitely more) are now the third leading cause of fatal car crashes in B.C. 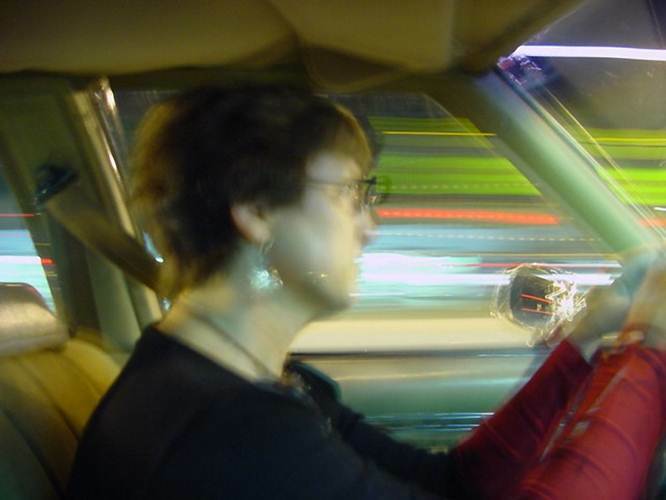 (speed and impaired driving are the top offenders), according to ICBC. On average, 91 people are killed each year in our province due to drivers who have zoned out from their responsibilities behind the wheel. So tune in to what’s in front of you, when you’re in control of a vehicle. Don’t be driving distracted!